Jim Beley is the General Manager of The Umstead Hotel and Spa, North Carolina’s premier AAA Five Diamond and Forbes Five Star-rated hotel property. A dynamic leader, Jim directs day-to-day operations at the 150-room hotel. His distinctive approach to the hospitality industry is reflected in The Umstead’s “vision and values” which he spearheaded to emphasize respect, personal and professional growth, and happiness in the workplace, ultimately outlining how these qualities translate into superior guest service. In January 2011, Jim received the prestigious Lodging Operator of the Year award from the North Carolina Restaurant and Lodging Association. 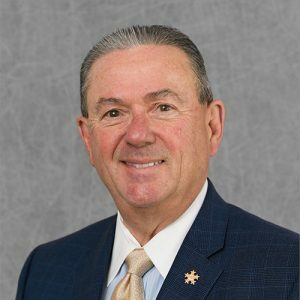 Prior to joining The Umstead in 2009, Jim served 24 years on management teams at Forbes Five Star and AAA Five Diamond hotels and resorts including the Inn at Palmetto Bluff Resort and the American Club. From 1984 to 1996, Jim held various positions with the Ritz-Carlton hotel company in Laguna Nigel, Calif., Naples, Fla., Atlanta, Ga., and Boston, Mass. He ended his tenure as General Manager of the Ritz-Carlton, Philadelphia, Pa..
Jim received his BS in Hotel Administration from Florida International University and an Associate Degree of Occupational Science from the Culinary Institute of America. A native of New York State, Jim now resides in Raleigh, North Carolina with his wife and four children. He serves as Chairman of the Board of the Greater Raleigh Convention and Visitors Bureau, Chairman of the NC Restaurant and Lodging Association /Hospitality Educational Foundation, Advisory Board Member of the Greater Raleigh Chamber of Commerce and is an active member of the United States Golf Association.